After 7 years of living in Atlanta, I finally made it over to Busy Bee’s Cafe. I’m sure you’ve all heard of it, it’s the popular hole in the wall place in the West End near the AUC that pumps out tons of Southern favorites. When we walked in the door, we were met with wall after wall covered in various awards, recognitions, articles and famous autographed faces. We decided to get our grub to go, so we walked up to the old school lunch counter and placed our order. I had the Spare ribs with Macaroni and Cheese, Collard Greens and a Cornbread muffin… and of course Peach Cobbler for dessert. 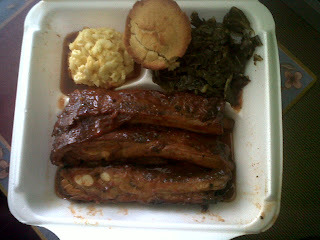 Everything was delicious, but the Mac and Cheese and Collard Greens were to die for! The Mac and Cheese was cheesy and creamy but not runny at all. The Collard Greens were seasoned perfectly with just enough spice to make my taste buds do a little jig in my mouth. 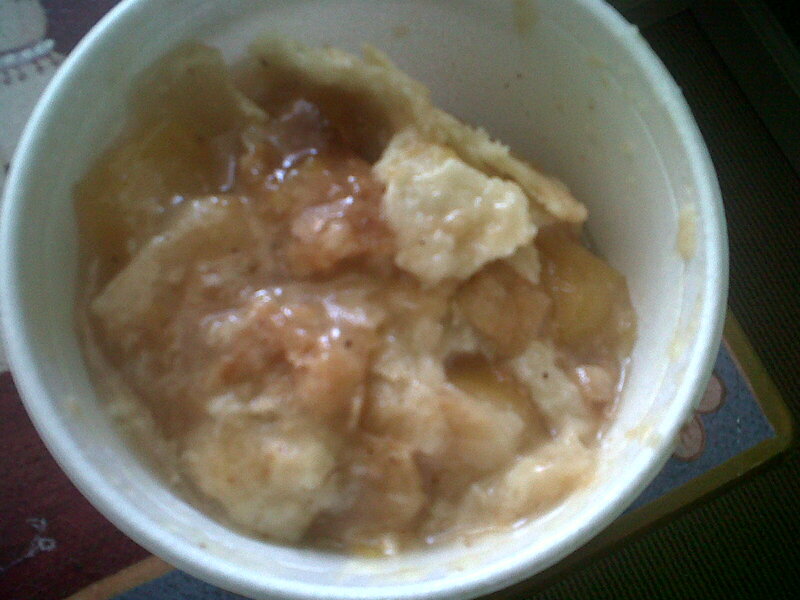 I was kinda disappointed in the Peach Cobbler; I’m not into the doughy crust… I prefer a nice crunch. I hate to say it, but this cobbler didn't do it for me at all. Now I’m thinking I should have gotten the Red Velvet cake instead.... but there’s always next time. 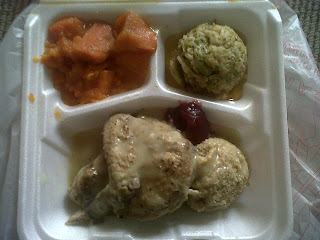 ﻿﻿﻿My Love had Baked Chicken with gravy, Stuffing, Cranberry sauce, Yams, Broccoli Casserole and a Cornbread muffin… and yes, another doughy peach cobbler. As she started eating, she announced, “I’m going to eat really, really slow, so that I can savor every single bite, it’s soooo good!” And she did exactly that! I was surprised how delicious the Broccoli Casserole was. It was a tasty combination of broccoli, rice and cheese that just melted in my mouth. She thoroughly enjoyed everything on her plate. Overall the food was yummy and it definitely hit soul food/comfort food spot. We will go back the next time we need a fix! I think I’m going for the Fried Fish the next time I visit Busy Bee’s Cafe and Red Velvet, definitely Red Velvet cake. If you haven’t been yet, make sure you check it out soon! You guys have a wonderful Monday! See you back here on Wednesday for “Midweek Eats”! I haven't been to that place since my CAU days (i think)...I tend to forget about it until I hear someone speak of it. Glad it's still good. Thanks for the reminder! Your welcome! It was really good too, a nice treat on my 'eat whatever I want day' lol!